Panpsychism is a philosophy unlike Idealism and Physicalism (discussed previously in the aside: Philosophies and Nonduality). Idealism denies the reality of matter while Materialism/Physicalism denies the autonomy of mind. Alternatively, panpsychism proposes that a ubiquitous, mentalistic property is present in all energy/matter. There is a subtle yet important difference between panpsychism and Quadernity. Panpsychism proposes that the intrinsic nature of all matter is essentially mental, which at some critical level becomes traditionally conscious. Quadernity argues that the intrinsic nature of all-that-is, the Oneness, or the Eternal Comprehensive Perfection, is a balanced, dynamic interplay between Consciousness and Corporeality. Poets seeking in their heart with wisdom found the bond of existence and non-existence. Their cord was extended across. This quote points to an interval, a duration, or an instant during which something that was not becomes something that is. For Irigaray, man and woman are not cognizable prior to the articulation of the interval. The emergence of the interval is the very condition on which woman and man emerge as sexed beings. Each subject is engendered in the relation to the other through the interval. Quadernity puts the Male and Female principals/principles on equal footing. Although similarly agreeing that the partners emerge together, Quadernity goes further, describing their relationships in the metaphysical/invisible realm, as well as in the physical/visible realm. Ritu comes from the root ri — to create, and the added suffix tu — indicates the intentionality of that act of creation, or the duration of its completion. while the suffix -tu, moment, will stand for the actual new creation [Quadernity’s Conscious Corporeality] emerging from the act of ri-. Notice how the Sanskrit word “ritu” includes intentionality (indicating causal Subjects), the duration of the actions they take, and the emergent creation (Objects of Consciousness and Corporeality). In Quadernity, we rely on the grammatical and syntactical definitions more than is typically done in philosophy or consciousness studies. Harvesting nuances from linguistic topology allows us to explore Subjectivity and Objectivity in both the physical and metaphysical realms. 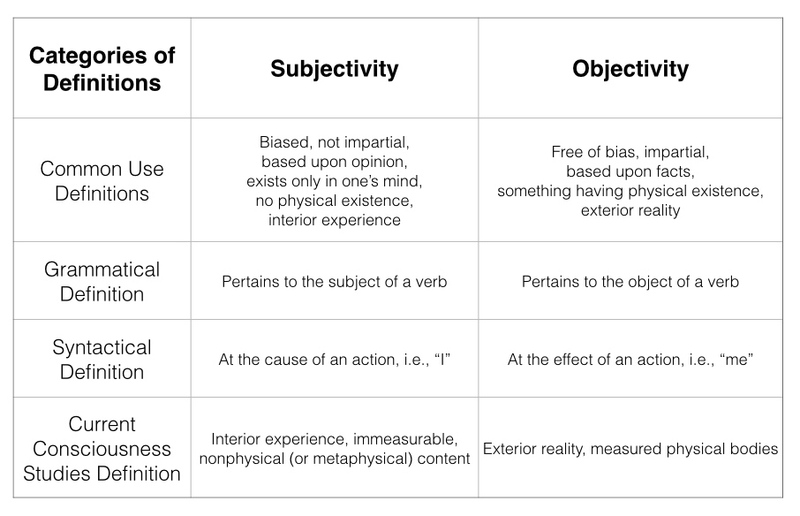 Using this chart, we will explore how the difference in definitions can affect our analysis of subjectivity and objectivity. In philosophy and consciousness studies, thoughts and meanings are considered subjective because they are internal and related to consciousness. Quadernity, employing the linguistic framework, takes a different approach: the thoughts/meanings that appear as internal patterns formed in consciousness (metaphysical) are considered Objects because they are derived from (they are at the effect of) the Male Subject’s causal acts of INforming. What appears as energy/matter in the physio-spatial vicinity of a sentient observer (Male) is considered by philosophers to be objective because it is external and measurably real. Quadernity agrees that energy/matter is objective; however, the reasoning for this determination differs from the philospher’s reasoning. Quadernity says that what is derived from the Female Subject’s causal acts of OUTforming are Objects for the very same reason that what is derived from the Male Subject’s causal acts of Informing are Objects. Objects are at the effect of subjective/causal actions. The Objects of the Female’s acts of OUTforming are physical matter in space, and the Objects of the Male’s acts of INforming are metaphysical patterns in mind. Both physical matter and metaphysical patterns are Objects. Whether the Objects are deemed to be internal or external has only to do with a one-sided perspective, that of the Male’s conscious experience. For the philosophers (perhaps excepting Christian de Quincey and a few others), the Female has no experiential perspective; they believe matter (as defined by DesCartes’ duality) is non-conscious, and because they tie consciousness to subjectivity, they cannot see how the Female can be causal. This self-inflicted error of omission (disregarding the definitions from linguistic topology) causes problems that will remain insoluble until the definitions are revised. The Female is, as Quadernity clearly shows, the Subject who receives metaphysical patterns and makes Objects to Outform the physical realm. The Male, as we recall, is the Subject who perceives physical matter and makes meaningful emanations of it to Inform the metaphysical realm. Both Male and Female have subjective (read causal) aspects that perform actions and have objective aspects that reflect something (at the effect of the causal action) back to the other partner. Regardless of our gender, each of us is both causally Female and Male and effectively Female and Male. The entwined, inverse processes enacted by the Male and Female partners are called INformation (which produces Objects of consciousness) and OUTformation (which produces Objects of corporeality), respectively. The dynamical processes form the necessary feedback between consciousness and corporeality, or mind and matter. This feedback loop is evident everywhere, though largely misunderstood. Mingled-in together in the homogenous metaphysical realm, the Female Subject receives Male-emanated patterns of Mind and this instigates the structural aggregation of Her substance, which, on the physical level, materially reflects His patterns. This was described in the Divine Divisions as the “Private Night-time Relationship” between the Female Subject and the Male Object. The patterned matter/structured substance is then singled-out by the observer, the Male Subject, who prehends it via physical receptors. His reaction and subsequent emanations produce interference patterns, which are recorded in the collective consciousness/Mind. In Divine Divisions, this was called the “Public Day-time Relationship” between the Male Subject and the Female Object. Quadernity has four quadrants, which make room for the causal Subjects to interact with the effective Objects on contiguous dimensions. Without the model to map all four quadrants, one is stuck in his/her familiar physical dimension (lower quadrants) with the problem of determining which of the two singled-out lower quadrant occupants is real, the Observer/Conscious Subject or the Observed/Corporeal Object. If they are both real, which is primal? Which is intrinsic to the other? Although Alfred North Whitehead introduced the potentiality/freedom of the agent/Subject to act, he claims Subjects become Objects, and Objects become Subjects; in contrast, Quadernity shows a feedback loop wherein a Subject on one level receives as input the Object of the other Subject, and then outputs an Object in return. The Subjects never become the Objects, anymore than a mother becomes her baby. This iterative feedback explains the persistence of patterned matter, the fixated perspectives of a conscious observer “caught in a loop”, the conservation of energy, inherited memories/instincts/behaviors, etc.